In the depths of disappointment at Hampden Derek McInnes was asked about the sending off of Dom Ball and quickly dragged in the injury to Gary Mackay-Steven during the Betfred Cup Final in December. While both players suffered head knocks there was a world of difference between both incidents as social media quickly exposed. Only the most blinkered would try to justify the way that Ball clashed with Christie, it was a challenge that he was never going to win with his point of contact bound to cause damage to an opponents. The pictures of the damage done to the Celtic midfielder tell their own story. Back in December as a cross was sent in from the Aberdeen right Dedryck Boyata and Mackay-Steven were both travelling in the same direction. The Celtic defender got there just in front of his former team-mate with both players colliding. 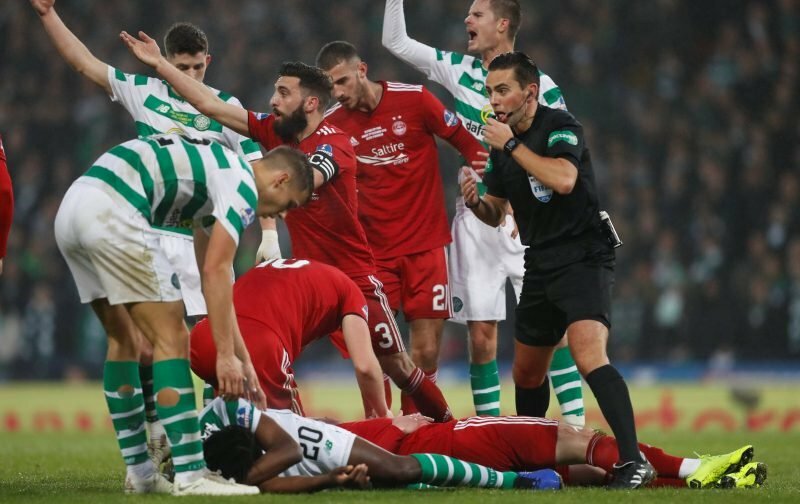 Mackay-Steven was taken to hospital, after a seven minute stoppage to play Celtic played on for a couple of minutes before Boyata returned to the pitch heavily bandaged. There was no comparison between the two incidents, hopefully Christie makes a full recovery with the photographic evidence showing the full extent of the damage caused by Ball’s late challenge.